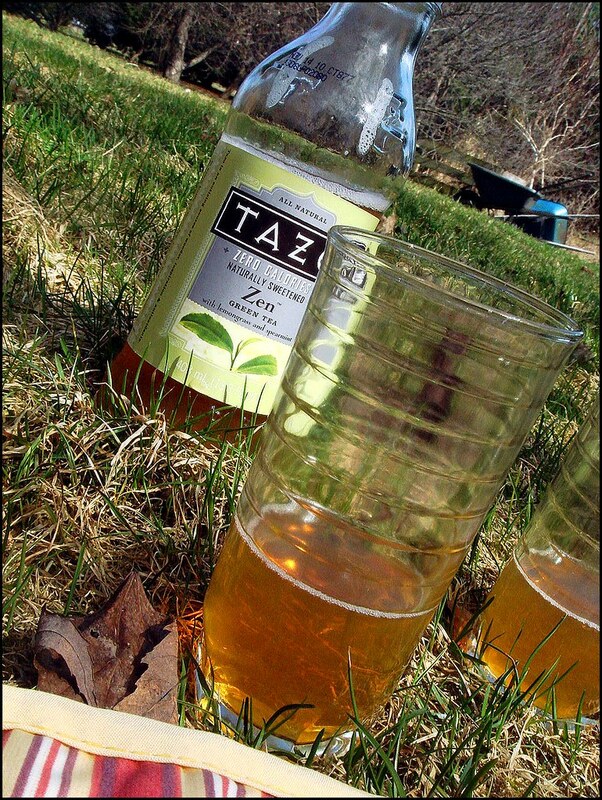 Tazo has launched a new line of zero calorie, naturally sweetened teas and I got the opportunity, thanks to the awesome Tazoians, to test them out. They also are letting me host a giveaway for my readers! 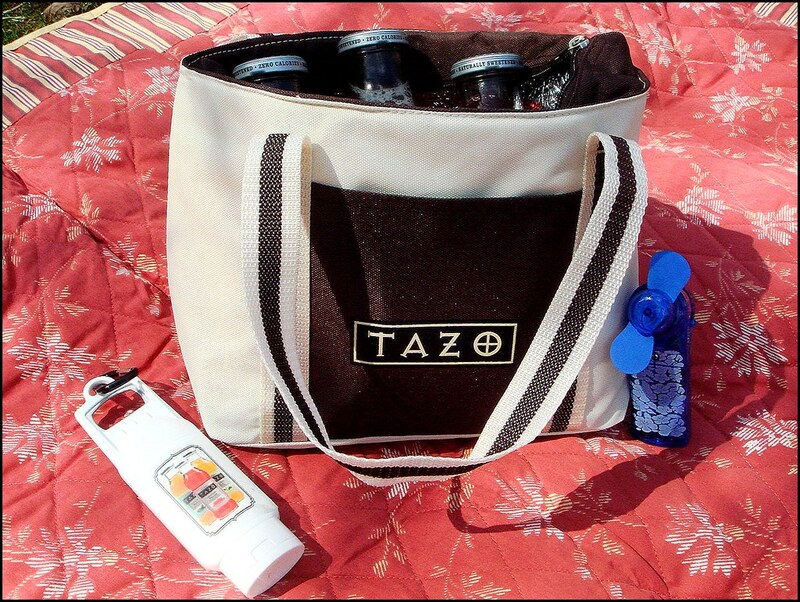 The giveaway includes a summer wellness pack which includes a really cool Tazo insulated canvas tote bag, a freezer pack for keeping contents cool, a little tube of SPF 30 sunscreen, a mini hand-held fan, and a nifty little Tazo teabag container with three teabags of the same flavor as the Tazo Zero teas. What I noticed with the teas is the light, refreshing flavor, and I was particularly surprised by the sweetness level, which is less than most sweetened teas available. While I feel that flavored teas benefit from the sweetener bringing out the flavors, I liked the subtle sweetness these had. There is a slight licorice aftertaste from the stevia, but I don't feel that it detracted from the tea at all. My favorite flavor out of the three (Zen, Passion, Refresh) is the Passion, an exotic hibiscus flowers, natural flavors of mango and passion fruit, lemongrass and tart rose hips. I felt it had the most flavor of the three and I just like the tropical flavors quite a bit. The Zen, a blend of green tea, lemongrass, and spearmint, was good and really refreshing, though after a while I though the spearmint overshadowed the green tea and lemongrass. I liked the lemony flavor, though! The Refresh is also good, peppermint, spearmint, and tarragon, but it reminded me of a nightly cup of peppermint tea so I don't think I'd go for this flavor if I was out and wanted something cool in the middle of the day. Just a personal preference as the flavor was still on par with the others. To enter, please leave a comment on this entry, telling me what you're most looking forward to this summer! Please comment each time you complete an additional entry. Contest ends on 29 Monday when I'll pick the two winners! The winners have about 24 hours to reply. Good luck! Love love Tazo tea! And I could totally use sunblock! I'm most looking forward to not being eligible for this contest because I live in Japan. 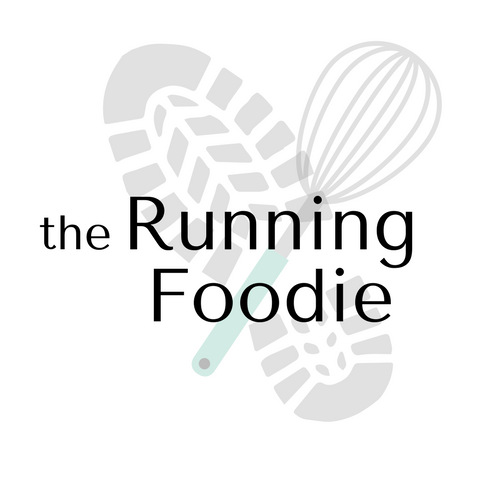 Running, eating, and Tazo? These are three of my favorite things. I have yet to try stevia, but it's going on my shopping list. I'll pick it up next time I'm at my local Trader Joe's. 1. I'm convinced this will be the best summer ever because I've lost 140 pounds thanks to my extreme dieting and running (also training for a half marathon). I think it will be completely different experience for me without all the extra weight. Maybe I'll actually wear shorts and a tank top. 2. I turn the big 30! 3. I'll be celebrating my 7 year wedding anniversary. 4. This summer marks the beginning of my husband's last year of medical school. Thanks! When is your half marathon? Mine is actually April 25 in Oklahoma City. = ) So excited!!! 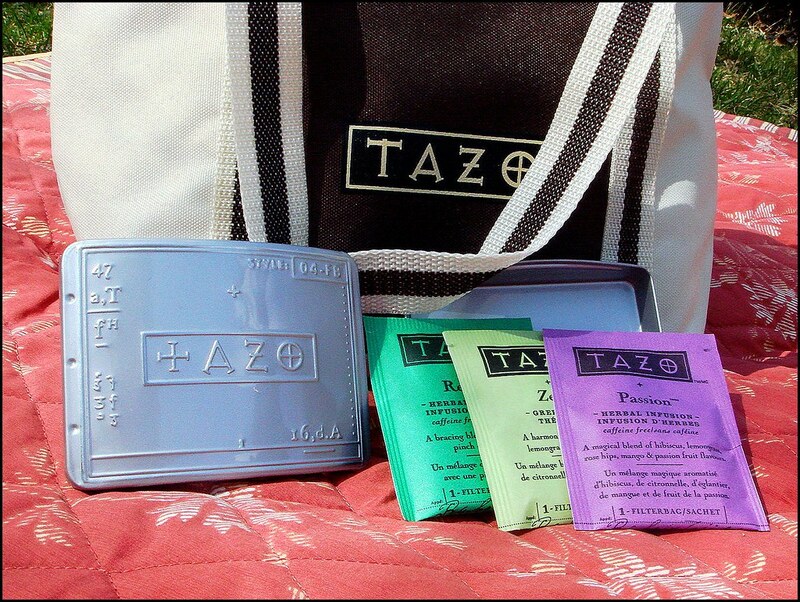 I am looking forward to not wearing winter jackets and walking everywhere..
Oh man, I love Tazo, and the swag looks pretty awesome! Hmmm, this summer, I am really excited to go back to Korea for the first time. That's probably something I could do at any time of the year, but it's my only summer plan so far, so I'm really pumped! My husband turned my onto your blog...I love it! I am looking forward to running in tank tops this summer, and lots of beach time with the kids. Thanks for all the yummy recipes. I am super excited to spend a couple of weeks on an island in the mediterranean, and to see some friends I haven't seen in awhile! What a great giveaway! I'd love to try these teas. I'm most looking forward to horseback riding, no school, and WARMTH! I'm looking forward to a much needed period of rest and relaxation (unless I get the internship position then I'm looking forward for all the experience I shall gain). I'm definitely excited about sleevelessness! And Tazo green tea mixed with lemon *mmm*. Can't wait for summer, my favorite season. Love thinking about having a new healthy and tasty beverage option for quenching my thirst! Mmmm... actually, that Refresh kind sounds delicious. SweetLeaf makes a really fantastic Mint and Honey tea... I'm a big fan. I'm looking forward to my first summer as a college graduate. Although my employment status is yet to be determined, I'm going to really enjoy striking out on my own and setting up my very first kitchen: buying a few nice knives, a couple of fun gadgets, and experimenting away. Additionally, I've decided to embark on a taco-stand tour of my Texas hometown. Should be a blast -- hope yours is too! PS. That little aluminum container kind of makes me drool. spending lots of time outside playing and less hectic schedules! I'm looking most forward to finally having free time to myself without classes and homework. And being able to run outside allll the time. I blogged about it today in my WW on Saturday post. Since I only show one at a time I didn't want either to get bumped, so just did them together. Thanks for the giveaway. I am looking forward to sunshine, warmth, and being that much closer to a goal. Thx for offering such a sweet summer surprise for your readers. I'm looking forward to picking lots of blueberries with my boys this summer so sunblock is a must -- along with some yummy tea after all our hard work! 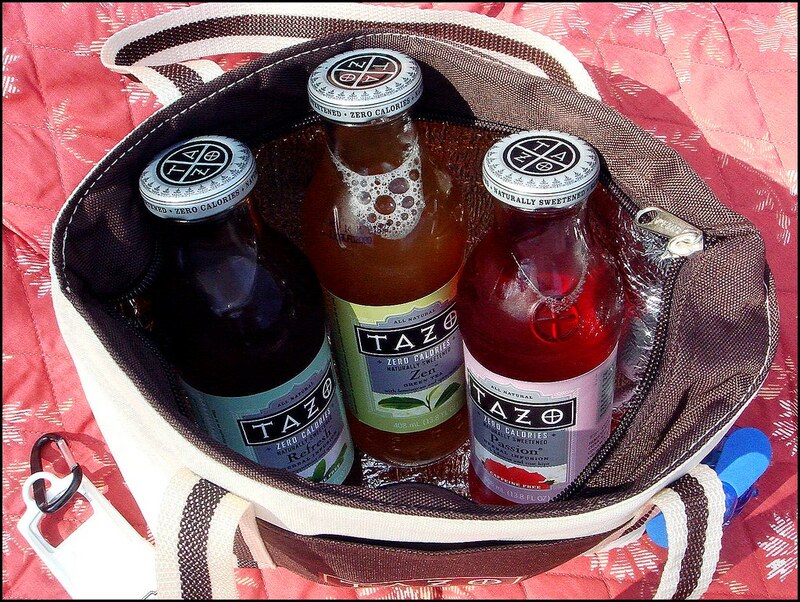 I love tazo mint teas! thanks for the chance to win! I'm most looking forward to warm days in the sunshine! I'm looking forward to my summer edible garden. Thanks! I'm super excited about that moment when you first get into the heat of your car after being inside an air-conditioned place...it feels like you're melting and it's amazing!